Passed away peacefully 28.3.19. Beloved husband of Kerryn, loved Dad of Sharon, Steven and Nathan. Father-in-law to Dave and Nicola. Poppy to Steve, Jade, Jordan, Ruby and Izabelle. Rest in peace. You will be sadly missed. Thanking staff and doctors at Selby Lodge for all your care and attention. 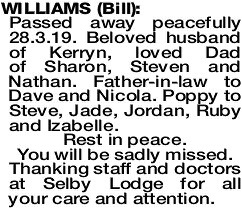 The Funeral Service to celebrate the life of the late Mr William (Bill) Williams of Rockingham will be held at the Cruising Yacht Club, 2 Val Street, Rockingham on FRIDAY (5.4.2019) commencing at 10am. Treasured memories of our brother and uncle, Bill. Deepest sympathy and love to Kerryn and family. Love Cheryl, Kev, Norm, Heather, Karen, Pete and families. Happy memories over many many years. Suffer no more Bill. Rest in Peace. Sincere condolences to Kerryn and family.